Earlier on Saturday morning, 2,058 players arrived in Lyon to play in the main event—the last major Modern event before Bloodbraid Elf and Jace, the Mind Sculptor would become legal. In the end, it was Grzegorz Kowalski who was triumphant with his innovative Red-Green Eldrazi deck, defeating No. 20 Márcio Carvalho and his Abzan deck in the finals. Over the course of the weekend, we saw plenty of sweet decks, but in the end the Top 8 was dominated by the color green. David Juric on Jeskai Control was the only non-green player in the Top 8; all others ran either Tarmogoyf or Ancient Stirrings. The following are my picks for things to remember from this Grand Prix. The name "Tron" refers to assembling all three Urza lands, originally dubbed as the "Urzatron". When Urza's Tower, Urza’s Power Plant, and Urza’s Mine are all on the battlefield together, they tap for extra mana, allowing Karn Liberated to be cast as early as turn three. And Karn came down quite frequently this tournament, as half of the players in the Top 8 reached the elimination rounds with Mono-Green Tron, relying on Ancient Stirrings and Sylvan Scrying for consistency. Although a black splash for Fatal Push and Collective Brutality was popular at Pro Tour Rivals of Ixalan two weeks ago, this weekend the competitors were more afraid of Field of Ruin and put their faith in basic Forests. Tron's performance makes sense because of its solid matchups against Five-Color Humans and Lantern Control—the two breakout decks from Pro Tour Rivals of Ixalan. Given that these decks were on the rise, Tron seemed to be well-positioned this weekend, and the deck choice paid off for Davide Cappiello, Joshua Bausch, Julien Stihle, and Matic Penko. Yet despite the high number of Tron decks in the Top 8, the archetype did not dominate the event as a whole. There were only two Mono-Green Tron decks among the 9-32 place finishers. What's more, there was no Tron deck in the finals. In these highlight pieces, we tend to focus mostly on the main event where the big prizes and the Pro Tour qualifications are given out. But from Friday afternoon till Sunday evening, the hall was abuzz with action, and you don't need to make a deep run on Day 2 to come away with great memories. Seven-year-old Dana Fischer, combining a family trip to Europe with her quest to become the youngest player ever to make Day 2, took her Elves deck to a 5-3 record on Day 1—her best finish to date. Although she needed one more win to advance to Day 2, she came close and used her time on Sunday in one of the best ways possible. The crowds that artist Magali Villeneuve drew this weekend were out of this world, reminiscent of Kaladesh's Inventors' Fair. The Grand Prix Lyon playmat featured her beautiful art for the Rivals of Ixalan Negate, and fans were queuing up all weekend for her autograph, alters, and sketches. In fact, after the finals completed and the entire feature match had been packed up, she was still signing! Fortunately, she was not alone. From Friday to Sunday, she received some help at the artist booth from Chandra, Torch of Defiance, one of the many Magic cards that Villeneuve so beautifully illustrated and cosplayed this weekend by Manju. We're hoping to see both of them at many future GPs to come! Modern had always been a brewer's paradise, and the turnout of wacky designs didn't disappoint at this event either. The one which likely drew the most attention and raised the most eyebrows was Andreas Schulte's Soulflayer Surprise, which remained undefeated up until Round 7. Soulflayer had made a new friend with the recent release of Rivals of Ixalan. When asked what he thought upon seeing Zetalpa, Primal Dawn for the first time, Schulte said, "I knew I would put it in my deck. It's such a good card; I had to put it in as a four-of." One of the neatest things about Schulte's deck was that Soulflayer was hardly ever impacted by things like Nihil Spellbomb or Surgical Extraction. After resolving Faithless Looting or Commune with the Gods, Schulte would have priority first and could pay delve costs before the opponent had a chance to intervene. "Multiple times on Saturday, players were like, 'Before you do that, I want to remove your graveyard,' and I had to tell them that that's not how it works," Schulte recounted. "There were a bunch of judge calls, and at least one opponent basically rage-quit when he received the ruling. A lot of fun really." We wondered how often Schulte won by hardcasting Drogskol Reaver? "I never did it before," he said after his Round 9 feature match. Well, he saved the best for the stream. Schulte also admitted that his list wasn't anywhere close to optimal yet: "For instance, Spark Elemental was fine as a 1-drop with haste, but only dying at end of turn was a problem several times. Fanatical Firebrand would have been much better in its place. There's still a lot of room for improvement here." Andreas Schulte wasn't the only player who showed up with an interesting brew; the diversity of Modern was on display all throughout the Swiss rounds. For a chronological list of all feature matches shown on camera, I compiled a handy guide with corresponding links to the Twitch archives. Check it out if you'd like to (re-)watch your favorite deck or player. Several rogue brews found success. Here are my picks for the most interesting and best-performing brews that stood out from this event. Most players were trying to win by dealing 20 damage. Some tried to dish out ten poison counters. And Dario Fässler was casting Hedron Crab and Glimpse the Unthinkable. Technically capable of a turn-one kill if the opponent starts with Polluted Delta and Serum Visions, his Archive Traps were surprising opponents all weekend, and his deck was a favorite of the Twitch chat. Fässler finished in 32nd place with a 12-3 record. "I don't think it's well positioned, but I love it," Niklas Kronberger said. The goal of his deck is to get Jeskai Ascendancy and a mana creature onto the battlefield as quickly as possible, and then repeatedly untap it while churning through his deck with cheap spells. Eventually, a 20-power Birds of Paradise or Fatestitcher can attack for the win. Kronberger finished the tournament with a respectable 11-4 record, and it was nice to see him come prepared for the tournament with custom-made "tokens" for the various Jeskai Ascendancy triggers. The tokens made it easy to visualize the stack, which was nice for his opponents, for himself, and for the people watching his Round 10 feature match. Although we didn't get to see Thomas Riedo on camera, his list is a spicy one. If you play Gifts Ungiven and search for only two cards, which is a legal play, then your opponent has to put both into the graveyard. This means that fetching Ashen Rider and Unburial Rites will work out nicely for you. Bring to Light can act as Gifts Ungiven number five through eight. And with a large amount of mana acceleration, his deck was capable of turn-three Gifts with startling consistency. Riedo finished in 31st place with a 12-3 record. It's always nice to see Spellstutter Sprite, Bitterblossom, and Mistbind Clique make a splash in Modern, and Michael Milis posted a 10-5 record with the deck this weekend. Also, his sideboard contains a copy of Jace, Architect of Thought. For the time being. Modern’s a blast right now, and pretty soon two spicy cards are coming back into the fold to allow even more potential for brewing. 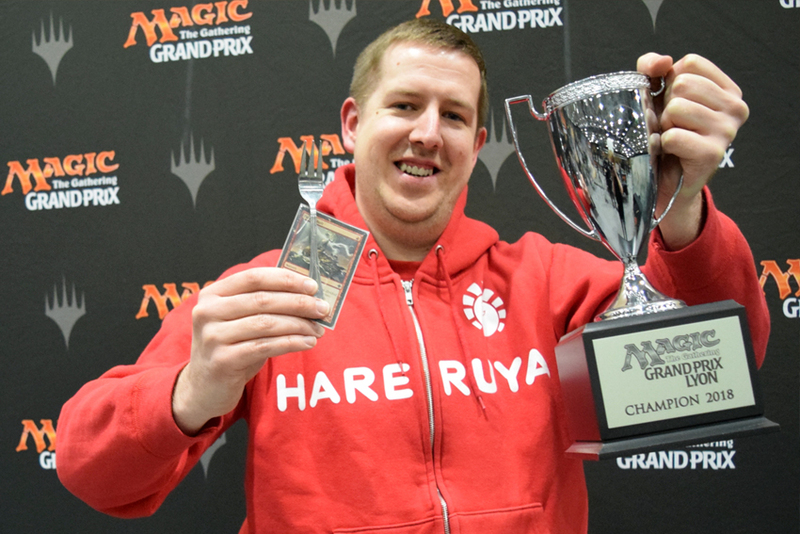 Polish Gold level pro Grzegorz Kowalski, in his fifth Grand Prix Top 8, took the trophy this weekend, and with a spicy deck to boot! While most of the players running Thought-Knot Seers and Reality Smashers had them in colorless Eldrazi Tron shells, Kowalski used them in a red-green build without the Tron set. Instead, he relied on Karplusan Forest and Grove of the Burnwillows to cast his colorless Eldrazi, and he supported them with Ancient Stirrings and Lightning Bolt. You can learn more about his deck and the power of Scavenging Ooze and Eldrazi Obligator in his Deck Tech from Pro Tour Rivals of Ixalan, where he unveiled the deck to the world and promptly piloted it to a 7-3 record in Modern. That was already an impressive result, but this weekend he truly showed the power of the deck. Compared to his Pro Tour build, he cut an Ulvenwald Tracker for the second Chalice of the Void in the sideboard. Yet he kept the other 74 cards intact, most notably the singleton Forked Bolt that he said was his MVP all weekend. In the Top 8, Kowalski put on a clinic in how to play the deck. He started by defeating Davide Cappiello's Mono-Green Tron in the quarterfinals. Given that his deck featured colorless threats that can't be exiled by Ugin, the Spirit Dragon, along with Eldrazi Obligator to steal their massive creatures, the matchup looked to be in his favor. He then smashed another Tron deck in his semifinals against Julien Stihle, reminding everyone that you can indeed select Crumble to Dust with Ancient Stirrings. Yup, it's colorless! He chose the card with Ancient Stirrings and proceeded to exile his opponent's hopes of ever assembling the Tron. And in his finals against No. 20 Márcio Carvalho, he beautifully navigated tight damage races that were made even more complicated by the potential of Eldrazi Obligator and the presence of Kessig Wolf run. The finals went to three games, but in the third his Reality Smashers showed up in droves. Over the course of three consecutive turns, he chained three Reality Smashers, made wise attacks in the face of Liliana of the Veil, and won the tournament with a deck that almost no one saw coming. Congratulations to Grzegorz Kowalski, your Grand Prix Lyon 2018 champion!